It’s not normally considered a risky sport, considering there is no physical contact. And those that play doubles are particularly at ‘high risk’ of a serious eye injury than singles players, the experts said. The researchers, at Capital Medical University, Beijing, added that people with impaired sight shouldn’t play at all. Dr Yi Liu, study co-author, said: ‘Use of protective eye wear is highly recommended, based on expert professional guidance, safety education and awareness of the ocular injuries that can occur. In five of the total cases, the injury was penetrating which is considered a ‘trauma’ that can cause permanent vision loss. Dr Liu said: ‘Assessment of injury type showed that 58 were hyphaema, where blood collects in the front chamber of the eye, and 36 of these had progressed to secondary glaucoma. 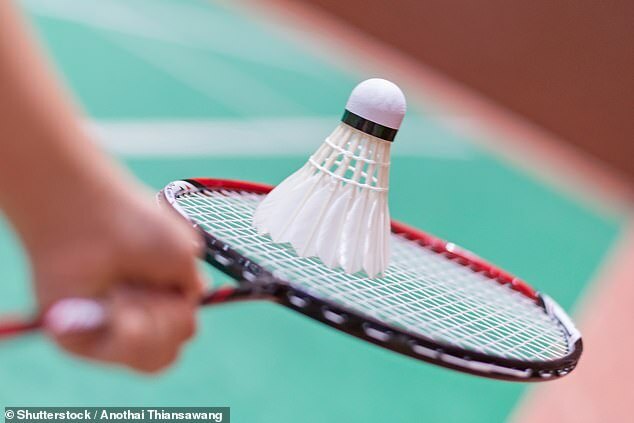 And in countries where it is widely played, such as China, the researchers are concerned that badminton causes a ‘substantial’ proportion of sports-related eye injuries. Half of the injured study participants weren’t aware that badminton could be regarded as a ‘high risk’ sport because of its association with eye injury. He said: ‘I’ve had a few people that have had eye injuries, the majority from a shuttlecock. Although some people have previously tried to push for recommendations – particularly parents – Mr Clapham said it’s not justified. He said: ‘Unfortunately it’s one of those things where there isn’t enough injuries to justify it, especially in the professional end. ‘A shuttlecock travelling at very high speed can cause devastating injury to an eye and its surrounding.